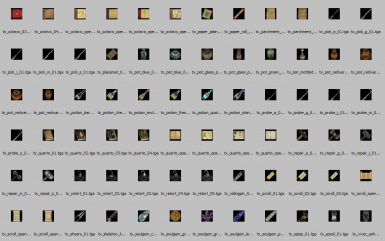 Replaces all Morrowind object/inventory icons with better icons! You can do whatever you want with this mod but all I ask in return is that you give me and Hrnchamd credit if you distribute any part of this mod. Thanks to Hrnchamd for rescuing my mod from failure! Without his help fixing the brightness and contrast for the icons, this mod would have been doomed, never to be released. Thanks to the forum members (povuholo, Blouge, PeterBitt, Dae, iggey, KINGPIX, Frosty_theOzzie, nONatee.., and Enzo Dragon) who volunteered to test my mod and give me feedback. Many thanks for your help and advice! 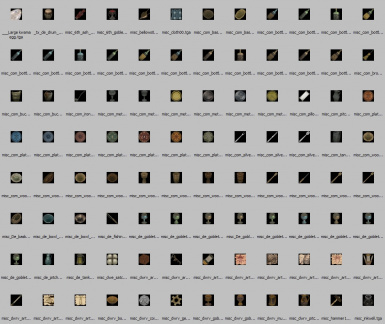 This mod replaces all 600+ icons for all the stuff you can put in your inventory in Morrowind, Tribunal, and Bloodmoon! The icons are remade to reduce the amount of empty space in the icon, and to increase item clarity. 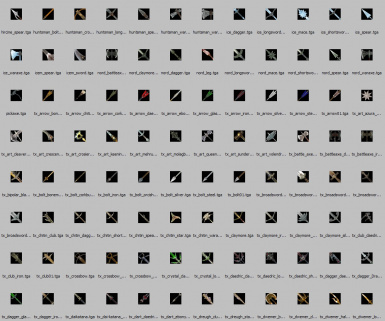 Also includes a download for people using Lurlock's Left Gloves mod or my own Left Gloves Addon mod so that your leftified gloves/gauntlets/bracers/pauldrons can have new icons, too! Oodles of thanks to Hrnchamd for rescuing this project! - you can easily remove any icon you don't like by deleting it. - does not include some of the more obscure items not seen in-game, such as the ball-and-shackles and the Devourer artifact book. 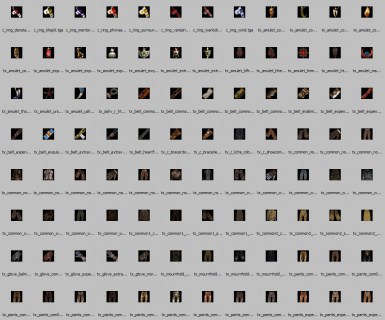 Check the screenies to see what is included in this mod. 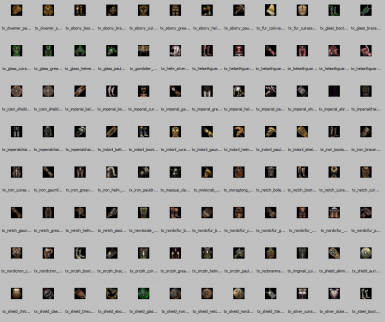 Delete the stuff in your icon folder. 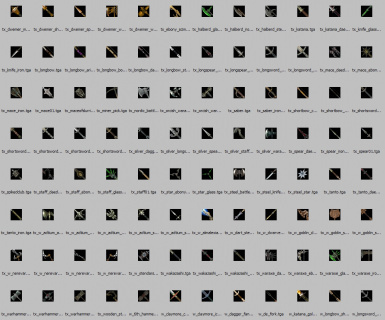 Hint: look for icons last modified January 2011. 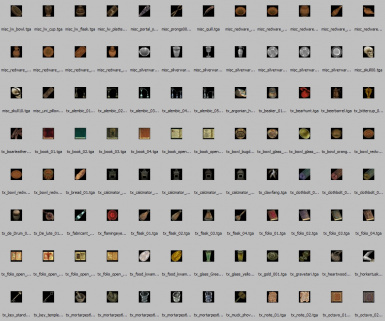 This mod will conflict with all mods that modify the same icons. This includes pluginless replacers! If you don't want to overwrite the icons from your pluginless replacers, then delete the ones from my mod. I highly suggest backing up all the icons added by mods in your Icons subfolders. 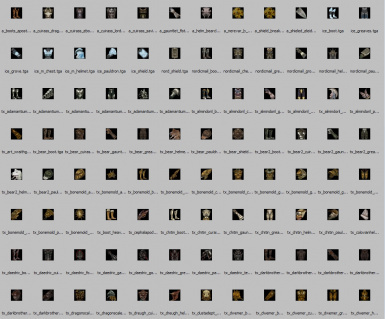 If you drag and drop my Icons folder into DataFiles, you will only be prompted to overwrite the subfolders - if you click "yes" then it will automatically overwrite not only the subfolder but all its contents, which means you might accidentally overwrite a mod's pluginless icon replacement. TO AVOID THIS: extract my mod to a temporary location. 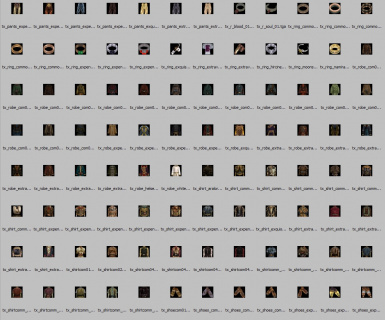 Copy all icons in folder Icons\a and paste into the Morrowind\Data Files\Icons\a folder. If asked to overwrite, decide which icon(s) you want (mine or a mod's) and click the appropriate option. 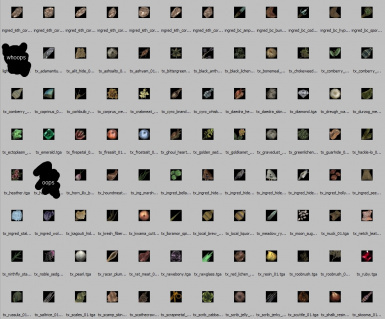 Do this method with all the icons in my mod's subfolders. Good luck! 1.0, 2011/2/8 - really actually fixed the Lefty files. If there are still problems, let me know. 1.0, 2011/2/4 - fixed folder paths for the Lefty optional download. Sorry for any inconvenience! 1.0, 2011/2/2 - Initial release.